Welcome to The Online Sports Affiliate Marketing Program! Sell Sports Products On Your Web Site! Do you have your own Web site? If so, you can earn commission by selling products for Online Sports! 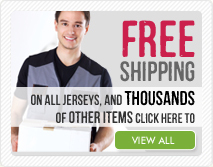 Online Sports is one of the oldest, largest, and most reputable retailers of Sports products online. Since July 1995, the Online Sports site has grown to include over 100,000 items including traditional Sports Equipment, Jerseys, Sports Jewelry and Watches, Memorabilia, Fan Gear, Collectibles, Gifts and more. We carry everything from bleachers and billiards to products in sports medicine and sports nutrition, equipment for track and field, exercise and fitness, camping and hunting, football, baseball, basketball, and almost any other sport you can imagine! Selling is easy - Online Sports provides you with suggested copy, html code, as well as product, text and banners links that you can use as you see fit on your site! Join the Online Sports affiliate program today and enjoy a profitable partnership with the Internet's oldest and largest category leader ! Key Features and Tools to help you succeed! It's easy and it's free. Why deal with the problems of setting up and running your own catalog, warehouse, customer service center, and distribution system when you can use ours! Provide additional content to your site by referencing recommended products at Online Sports. Team up with the leader in the Online Sport Products category. Take advantage of the support and encouragement of the Online Sports Affiliate team. Simply complete an Affiliate application. When you've been approved, all you need to do is copy and paste codes onto your site. That's it! We have teamed up with both ShareASale and Commission Junction to provide you with trusted third-party tracking, real-time reporting, and monthly commission checks. We have a high rate of repeat customers because of our excellent service. You will continue to make money from your customers for 45 days after they visit your site. Of course, if they come through your site again, the 45 day period begins anew, so you're always guaranteed to make money from repeat visitors to your site. To get started, just click one of the links below. There's no cost to you and it takes less than a minute. Once you've signed up, you can choose from a selection of banner, text, and product links to place on your site, email, and/or newsletter. Start earning CASH today as an OnlineSports.com affiliate! To make joining easier, the Online Sports Affiliate Marketing Program is available on both the ShareASale and Commission Junction networks. By offering our program on both networks, we give you, the affiliate, the option participate in the way that is most comfortable for you. Our program terms are the same on both networks, so please choose the network that you prefer.